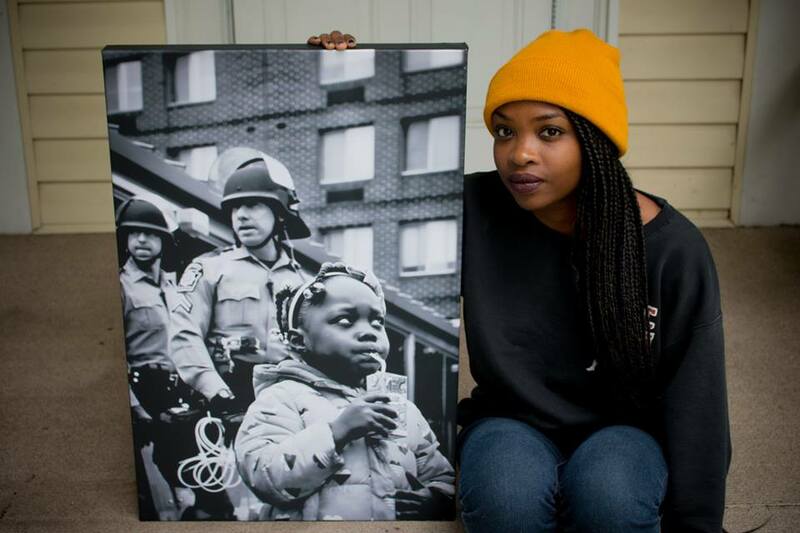 Artist and photographer Patience Zalanga holds one of her photos from the 2015 protests in Baltimore that followed the death of Freddie Gray. Photo courtesy of Patience Zalanga. “If you asked me what I was gonna be when I was like 20 [years old], photography was not something I would have said,” recalled artist Patience Zalanga. Yet in 2014, her life trajectory would change when she picked up her camera and headed to Ferguson, Missouri, after a grand jury failed to indict officer Darren Wilson in the fatal shooting of 18-year-old Michael Brown. This wasn’t her first time in Ferguson, Zalanga had spent time in Ferguson earlier that year in the days after Brown’s death and returned to the city just hours before the non-indictment charge was handed down. Initially too scared to bring her camera in case it got confiscated or damaged during the protests, or if she got arrested, this time Zalanga brought her camera. “Last night I caught my 7 year old daughter tearing up in the bathtub. Asked her what’s wrong, she said nothing. Closed the door and asked again. She went on to confess she keeps thinking about me being killed by the police and what happens if I get pulled over and she can’t save me? My. Child. Wants. To. Save. Me. From. The. Police.” – Brittany Ferrell, St Louis, MO. Photo by Patience Zalanga. This is why Zalanga brought her camera: to combat the media misinformation she herself had fallen victim to. 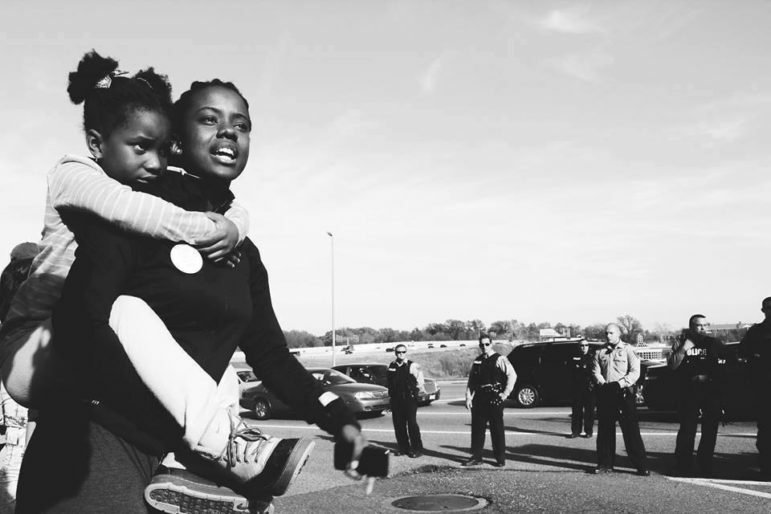 She wanted to document – accurately – what was happening in Ferguson, for her and her friends. She didn’t think much of the photos she was taking and sharing at the time. Image after image, her series of photos elicited the essence of what the Ferguson community was feeling and experiencing. There was pain. Disappointment. Anger. Resilience. As these photos reverberated across the internet, Zalanga and a fellow photographer, Nancy Musinguzi, found that their photos were resonating with more than just their friends. Musinguzi, a documentary photographer, visual journalist and mixed-media artist based in Minneapolis, met Zalanga in 2014 after they both responded to a Facebook post inviting Twin Cities folks to drive down to Ferguson in a show of solidarity. “As documentary photographers, it’s sort of in our natural set of instincts to want to create an honest record of truth during times of turmoil and disarray,” Musinguzi said. 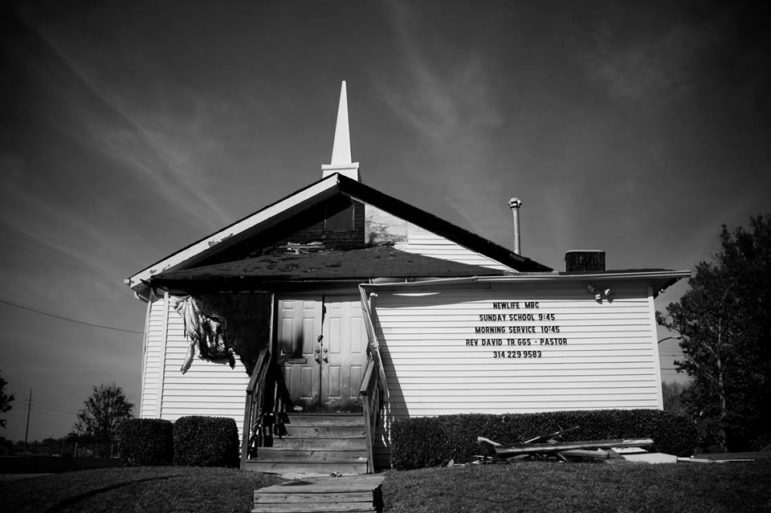 For Musinguzi, her work in Ferguson would lead her to self-publish a photo book, The Faithful Witness. For Zalanga, the photos would result in a flurry of media requests to use her images in both mainstream publications and smaller blogs. Handling these media requests is a thing Zalanga struggled with then, and continues to struggle with now. Her photos remain, primarily, a documentation of Black life, with a heavy focus on the Black Lives Matter movement and the Black community’s response to the murders of unarmed Black men: from Michael Brown to Philando Castille. At issue for her when it comes to media requests, is relenting control over how these photos are used outside of the context in which she created them. “Those frequent requests to use my photos, have been really hard ‘cause I don’t know what’s going to get attached to this picture,” Zalanga said. 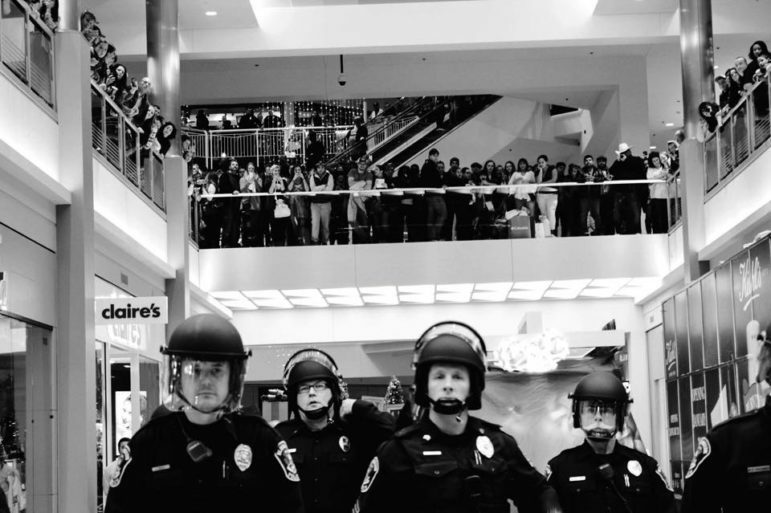 Police face protesters during a 2014 protest at the Mall of America. Photo courtesy of Patience Zalanga. Zalanga appreciates that an editor or journalist might like her images because they are aesthetically pleasing, but the larger question when granting permission is, “how are you using this photo and how is it going to create needed conversations?” The process of deciding a media group’s or blogger’s intent can be taxing for a Black photographer such as herself, particularly if she is unfamiliar with them. There is research on the individual journalist themselves as well as the news group they represent. What are their values? Their mission statement? Do those align with hers? For Zalanga, who is best described as a reluctant photojournalist, often times, it is just easier to not respond to these requests. A mentor, she tells me, would be helpful in navigating some of these issues. This uneasy relationship between media outlets, is also the reason Zalanga chooses to continue to work for herself. Zalanga’s work, as she sees it, is mostly for herself and the people who find the issues she covers to be important to them. Adja Gildersleve, a Minneapolis organizer and media producer is one of those people. As a photographer and videographer, Gildersleve has covered events alongside Zalanga and also been a subject of her photos. Gildersleve understands how crucial it is to have stories of the Black community told by the community itself. Sit in at the Fourth Precinct following the shooting death of Jamar Clark in Minneapolis, November 2015. Photo courtesy of Patience Zalanga. The issue of space is something that comes up repeatedly in conversation with Gildersleve, Musinguzi and Zalanga. 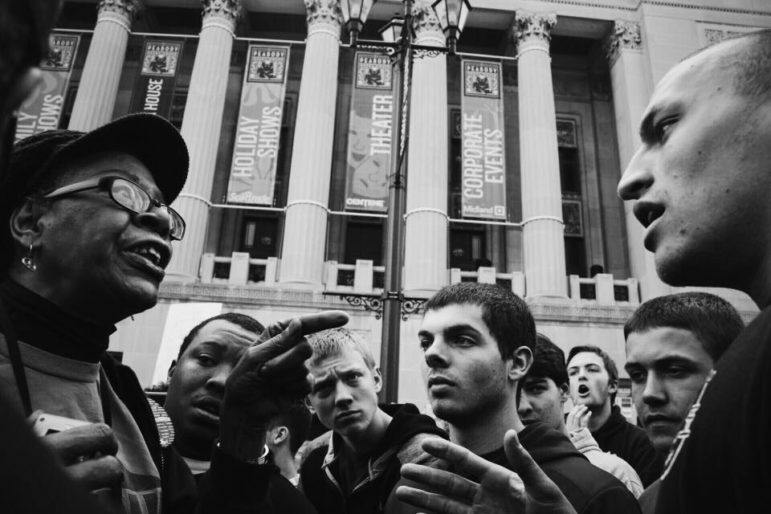 There is the space they occupy as documentarians; the very public community spaces in which they create their work; and the space that media outlets and their representatives occupy within that. For instance, as Musinguzi reflected on her experience in Ferguson, she feels conflicted. As an outsider to the community, was it appropriate to take on the task of documenting a community’s history through her lens, she asked herself. “My lack of proximity to Ferguson’s issue with law enforcement and disenfranchisement made me feel like I was intruding on someone’s land, trying to fix problems that weren’t mine to begin with,” Musinguzi said. 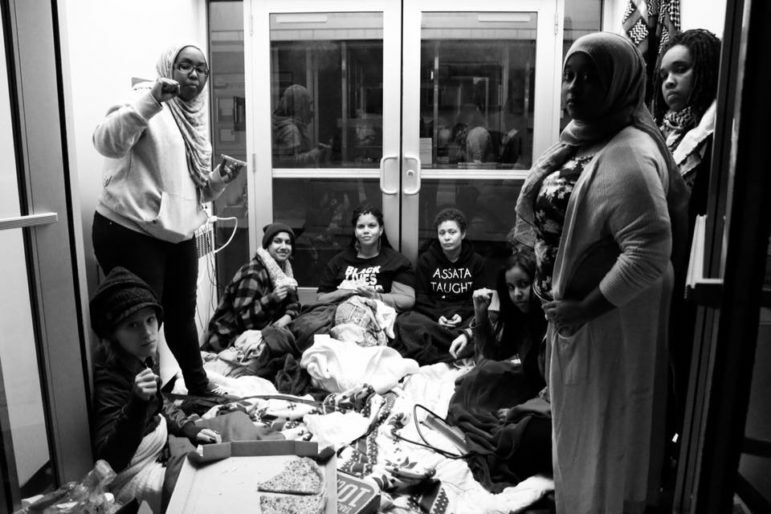 For Zalanga, the issue of occupying space came up as she sat on the steps of the Ramsey County Courthouse this June. As the jury deliberated officer Jeronimo Yanez’s verdict in the fatal shooting of Philando Castile, she watched Valerie Castile, Philando’s mother, and her family walk out of the courthouse. Immediately, they were swarmed by, predominantly white, photographers and journalists. Zalanga did not take any photos that day but she reflected on the amount of physical space taken up by journalists at these events. This is why Zalanga took her camera to the march organized after the acquittal of officer Yanez, rather than documenting the scenes at the courthouse. There, she captured the community’s response as hundreds came together to denounce the acquittal of Yanez on all charges. So far, Zalanga’s instincts have been right when it comes to photography. But with no formal training under her belt, she knows that there is still much to learn. When I ask what she is doing now, what projects she is working on, what her goals are, she tells me, she is resting and learning. The events she has documented over the last three years, from Minnesota to Missouri, have also taken a toll on her. “I didn’t realize how much it would affect me. The pictures stay with me,” she stated. But that doesn’t mean she’s not creating. As the daughter of Nigerian immigrants who moved to the United States when she was 2 years old, Zalanga also focuses on exploring her unique family history and the roots they’ve planted in the Midwest. Moving forward, she told me, her goal is to understand connections: connections to people, spaces and history – particularly as a Black woman living in Minnesota. A Black woman confronts Trump supporters at a 2016 rally. Photo courtesy of Patience Zalanga. I hope someone steps forward and answers her request to be her mentor. Interesting story! Ms. Zalanga raised a deep question about what it means to a photographer who takes pictures on serious matter and occurnces like she does. I wonder how many people think about that before, during and after they do their ‘jobs?’ You do obviously, and that’s what makes your photography meaningful. Please keep going with it. Sincere gratitude to the faithful witness. I would love to mentor you and help in anyway I can. You have a great talent, heart and passion and that is the most important of all. Youth-led climate movement taken to the State CapitolMinnesota Can’t Wait, a broad coalition of youth, has changed the course of Minnesota’s progressive climate politics when they packed the State Capitol in early February to enshrine the Minnesota Green New Deal. Modeled after the eponymously named federal legislative version, spearheaded by U.S. Representative Alexandria Ocasio-Cortez (D-NY) and U.S. Senator Ed Markey (D-MA), the Minnesota Green New Deal also proposes similar programs addressing climate change through the remaking of the economy. Could a police-free city be a viable option in Minneapolis?